There is a commercial on television recently in which a husband asks his wife, “Honey, can I quit my job and start a blog?” and it comes on frequently. I’ve no idea what it is advertising, because I always feel a little squirmy when I see it and forget to pay attention to the product. Inevitably, it runs when my husband and I are cuddled up watching NCIS or the 20th special showing on Avatar on FX. I quit my job and started this blog. Although that was not my intention when I put in my 2-weeks notice. I meant to take a little time to get healthier and reassess my goals and maybe do a little writing between interviews for a new, less stressful position. But two days after my last day of work, I broke my leg and had a metal plate, pins and screws surgically implanted so that I could walk again. This unforseen accident serendipitously allowed for more writing time than I expected. I would, I avowed, write a book – which is at the top of my bucket list anyway, so why not knock it out? Except – as I mentioned – I started this blog. And I love writing for the blog! I’m walking again, so I’m enjoying all of the domestic things I was too tired to do when I was working fulltime – cooking, cleaning, a little reading, spending time with my family. And I’m blogging, sometimes for hours. The days fly by at warp speed, and the days are good. Because I’m walking again, it is getting to be time to seek financially gainful employment, not just spiritually fulfilling purpose. I’m so grateful that I’ve had this block of time to focus on just writing. 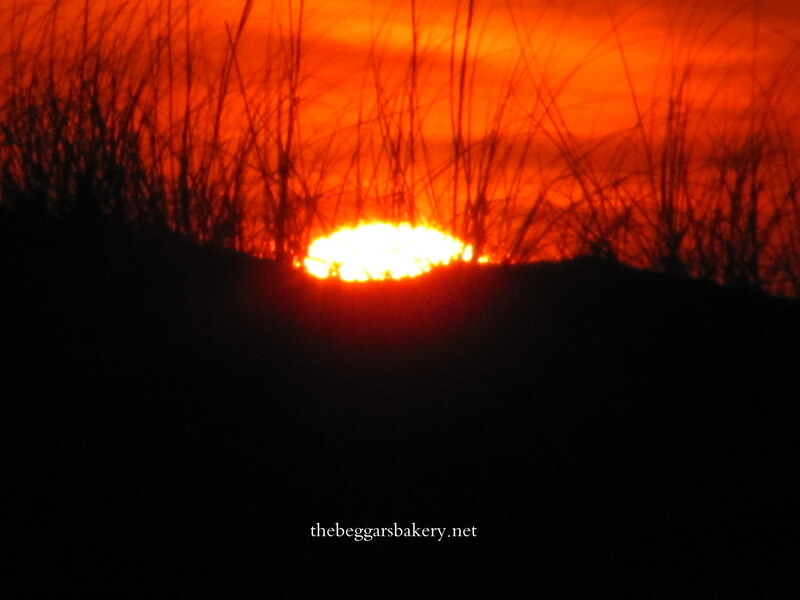 So, I might not be posting for The Beggar’s Bakery every single day. I’d like to concentrate a little on writing an actual book. I’m not that swell with time management; if I’m going to do it, I have to make it priority. Please sign up to receive new posts via email, if you’d like. And check back often. I will try to post at least every few days! A big, fat THANK YOU to everyone who reads The Beggar’s Bakery. The biggest, fattest thanks for my Most Excellent Husband, who believes in my writing; who believes in me, period. It’s so cool to be married to my best friend and have his unwavering support. I have to pinch myself most days to be sure it is all real; that I’ve gotten to write every day, that my husband encourages me to blog honest, that my friends cheer me on even though I sometimes embarrass myself, and that God just keeps showing me such grace in recovery and in life. I can’t wait to see where God takes me next, and to share it here. I wish I knew what it was but I don’t (and probably couldn’t handle it). Have faith, write, and let Him work through you. But of course, Stevie! Thank you – one autographed copy preordered just for you! Hugs! Thats my man! Thank you, Baby. I love you so, so much. Isn’t it interesting how God finds a way to carve out the time for us, when we start answering the dreams He put in our heart. Better to work for God than man. Keep going! And I love your photos too….stunning! Just like your writing! I’m almost afraid to stop blogging daily…afraid to lose my writing mo-jo…um, flow. Lol. Thank you for your support, girl! Thank you! That is the cross that hangs in my kitchen. Oh how I love Picassa, lol. Oh, thank you, Karen. Its a leap of faith for sure! SOOO, soooo proud of you and your blog! I Love reading it! You are an amazingggggg writer! I can’t wait for the book! Hugs to you! Now I just have to WRITE it, right? My 16 year old daughter today: “Mom….you’ve been talking about it forever. You can’t author a book until you WRITE it!” 🙂 Ohhhhhh……yeah. There’s THAT. Lol. Hugs to you, too, Linda – please keep me in your prayers about what to write! So, I am hooked and your blogging has been a great blessing to me! Write that book girl – we all need it! Love you my friend!! Thank you (((Cris))) – I’m struggling with finding the courage to write it!!! Thank you for your encouragement – I love you too, friend! HAHA. I haven’t seen this commercial and i really HOPE i don’t see it with my husband in the room. Yes, blogging takes a lot of time. But for me, in trying to get sober, it’s been a saving grace. And I am hoping to write a book too. My plan is to take all my blogs and print them out and then arrange them by subject matter or theme and see if it’s possible to create a frame work for the book from that first step. I plan to blog without focusing on the book for at least 8 months. I hope that will give me plenty of material to start with. It might be a way to help get you started. It also might help to join a writer’s group. We have something called Gemini Ink in our town that offers classes and seminar’s and groups for writers. I am joining the one for writing a memoir. It meets monthly and you share writings and get feedback. Good luck and I am so glad I found your blog!